Sustainable water projects in Pernambuco, Brazil, help transition municipal water supplies from a state of water scarcity to a state of water security. The state water utility, Companhia Pernambucana de Saneamento S.A. (Compesa), supplies water to the historic city of Olinda, where spring-fed reservoirs and deep wells have been impacted by drought. With the water network losing 56 percent of distributed water, the utility needed to reduce water losses and get more water to underserved zones. Compesa retained Enorsul Saneamento for a BRL 134 million project to optimize the water distribution system and reduce water losses by 56 percent. 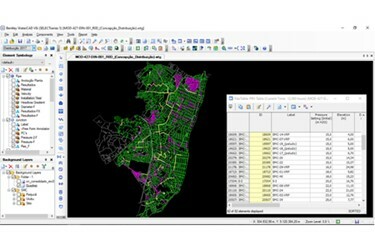 Enorsul modeled the system with WaterGEMS to identify and prioritize solutions, including implementation of 43 metering and control zones (MCZs). Hydraulic modeling shortened the study period from 18 to 10 months, allowing improvements to begin sooner than anticipated. Interventions totaling BRL 130 million were expected to payoff within six and a half years and eliminate water rationing within two years.